I had this conversation on Tiki Central about a year ago, and I think it has been long enough that I can reclaim it as my own. Ladies and Gentleman, I give you "The Mai Tai!" 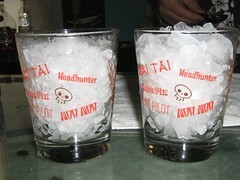 Here are some links to interesting bits about Mai Tais that I think you will enjoy, starting with Trader Vic's. Then there is the quest for the Ulitmate Mai Tai. One of my favorites commentaries from Joe Bob Briggs. 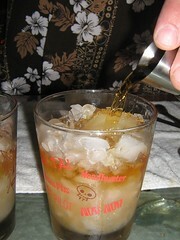 And, an interesting view of all of the 'different' Mai Tais available is over here at Drinkboy.com. 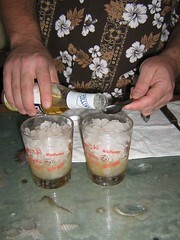 Then there are some interesting recipes and variations including this one from Drinkboy.com (notice the Floater). This one also makes special note of a float of Dark Rum. This One claims to be the "Original Hawaiian Recipe." This one is entertaining being the Mai Tai from Down Under. Then we have a Gift Basket for Mai Tai's. And lastly, we have one that fits in the "WTF?" category Here for those of you over 18. Why do I share all of this with you? To prove the point that every drink and every drinker out there has their own opinion of what a drink should be and that includes our esteemed Mai Tai. But! 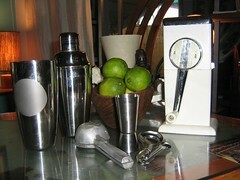 For the purposes of this experiment in Mixology we all need a common starting point. 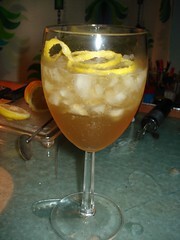 That starting point for us is Beachbum Berry's recipe from the Grog Log. Why the Beachbum's Recipe, you ask? Well, Trader Vic (original recipe) used ingredients that are no longer available. Don Beach uses too many ingredients for this kind of discussion and some of the ingredients are hard to come by these days. And, any other variation on the recipe would not serve us on our tasting adventure because the point of this kind of journey is to learn the origins of a thing so you can appreciate the thing in all of its variations. So, Grog Log in hand, let us take all of our new found taste knowledge a build us a Mai Tai! Our recipe starts with 1 1/2 ounces of Lime Juice. A fitting start to our drink since we started our adventure with this flavor. Our first choice is fresh squeezed. If fresh is not available, then bottled. 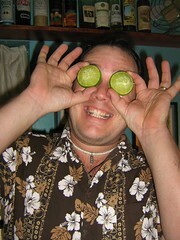 I suggest that if you are using fresh limes in season that you use less lime, closer to 1 ounce. 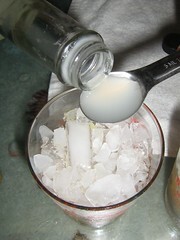 If you are using bottled lime or limes out of season (woody and/or dry) use the recipe measures. 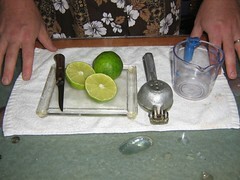 We discovered that lime is a sweet-tart flavor, the sweet will be offset by the 'heat' of the rum and the tart will be offset by both the sugar syrup and the Curacao and Orgeat. If your limes are more sweet or more sour than 'average' you will want to think about altering the amount of lime and probably in a generally less direction. Now, we add 1/2 ounce of Curacao. Curacao being a Orange flavor with spicy undertones (mostly on the nose). Blue Curacao IS the same as Orange or Red or Clear Curacao with the only exception being the blue coloring. It works just as well, but your cocktail will be a very unfortunate color when you are done. 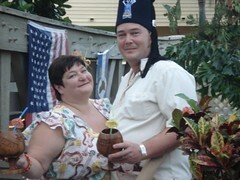 If using Blue Curacao may I suggest you serve in your favorite Tiki mug. What? You say you still don't have any Curacao? 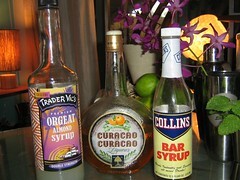 Here is what you need to keep in mind if you are substituting: Curacao is usually 30% alcohol (60 proof) or higher. Your substitute should be a reasonably close alcohol content and be orange based in its flavor. If what you are pouring is sweet, pour slightly less. If what you are pouring is 'weak' in the orange flavor, pour slightly more. 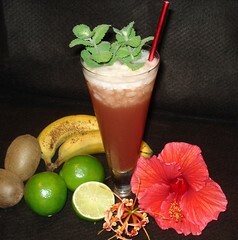 The flavor and aroma of the Orange blends wonderfully with the lime and adds that exotic feel to your Mai Tai. And now, the Orgeat. 1/4 ounce is all we need. Orgeat is almond based, with hints of Orange or Rose. It is also sweet, so measure carefully. The aroma of the Almond combines with the Orange from the Curacao to give us a wonderfully exotic aroma to our cocktail. And, like so many thing in life, quality counts. The better your Orgeat the better your cocktail. The Torani and similarly flavored syrups have the right flavor, but lack the subtle hints of a true Orgeat. I do not recommend that you alter this measure in any way as you risk the cocktail falling over the edge and being too sweet. 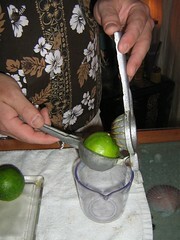 If you do feel that your particular pour is too sweet, add a dash more lime so the tart can balance the sweet. Then we need 1/4 ounce of Bar Syrup, or Simple Syrup, or Rock Candy Syrup. They are all about the same thing, Rock Candy being the sweetest overall. Why are we adding Sugar to a drink that already has two other sweeteners in it, you ask? Well, the other ingredients add a sweetness to our drink, but don't actually "Sweeten" the drink. It is the same concept as putting salt on something, it enhances the natural flavors. Sugar Syrup does the same thing for our cocktail, it balances the tart of the lime and enhances the flavors of the Curacao and Orgeat. If you are looking for a quality syrup, read the ingredients. You want to find one that is made from Cane Sugar or Cane Syrup. And, to get the most "Authentic" syrup, add a dash of Vanilla to the bottle. (It was a sad day indeed when things became "Plain old Vanilla" as it is one of the most exotic orchids on the planet.) Making your own is an excellent idea very easy to do. Let us stop to analyze what we have mixed so far: Lime, Orange, Almond, Sugar. Stop and smell the glass with the ingredients so far. Does it inspire images of the Tropics? Of half-naked people on a sandy beach? You should already have an exotic blend of aromas in your glass. If you taste this mixture so far, you will find it to be very sweet. It is better on the nose than on the tongue at this point and that is because this entire mixture is designed to off-set the 'heat' that the rum is going to add. Our recipe calls for 1 ounce each of a Jamaican and Martinique rum. Why those two? Well, pour yourself a shot and try it. 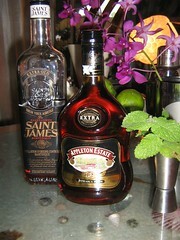 The Jamaican rum has a 'green' quality to it, something that reminds you of the fields of cane. 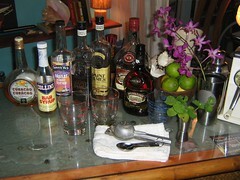 The Martinique rum is very complex, but overall on the dry side. The two combined balance each other into one simply elegant rum that is both lively and complex with a hint of spice, dry but not harsh. Now the hard part, Rum Age.... 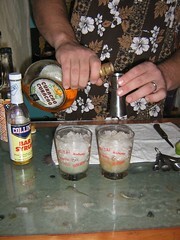 I suggest that you find the oldest rums you can afford to make your Mai Tais. Appleton has recently released a 21 year old rum that would make a fabulous Mai Tai, but if you are like me you will have a hard time paying $100 or more for a single bottle of rum. 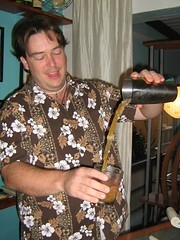 I am just as happy with my 12 year Appleton and am quite pleased with the Mai Tais I can make with it. I should have started with this, but it makes more sense here... You should be using Crushed or Cracked Ice, NOT cubes, or shaved, or blocks, or penguins or any other kind of shape. You need the fine quality of the ice to help chill your drink and the faster your drink chills the less watery it is going to become. Sounds odd doesn't it, melting small ice to prevent a watery drink... Well, a good Mai Tai is good all the way to the bottom of the drink. You get that by having your drink chilled to almost the same temperature as the ice, which prevents more melt and therefore more water getting into your drink. Look it up on the internet for the actual dynamics of it. Ahh, how to garnish the perfect cocktail.... Simple is always good. But, simple does not mean plain! I use the following: A cocktail pick with pineapple and cherries, one of the spent lime shells, an orchid flower, a sprig of mint, a sprinkling of powdered sugar and a straw. Sounds like a lot doesn't it? 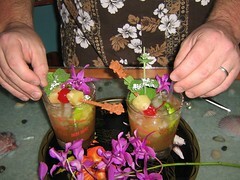 Well, a good Mai Tai is worth the effort. The pineapple and cherries and orchid are all 'pretty' to look at. The spent lime shell and the mint add to the final aroma of the drink and the sprinkle of powdered sugar is because I can. I also always use a straw cut to an appropriate length for the glass I am serving in. The straw is long enough to make the ladies with lipstick happy, but short enough that you still have to get all of the garnish in your nose to drink it. You can see the rest of these photos Here. 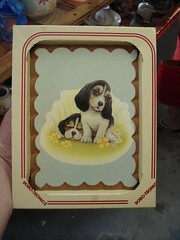 Cute little puppies. Painted on a wood that makes it's own frame. The name of the distributor.... Robotronics. Is this some sort of giant machine that is cranking out crappy little pieces of art that is only just barley worthy of QVC? In April of last year we took a little road trip to the west cost of Florida. Somewhere a bit north of St. Petersberg we drove by this place. 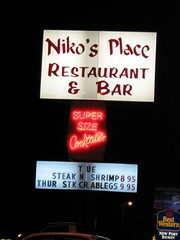 A Surf-n-Turf for only nine bucks sounds like quite the deal, but I think we will wait until Thursday for the crab. But, while we ar waiting, lets all enjoy some Super Size Cocktails. I read somewhere recently that someone said they never garnish thier cocktails, it takes too much time away from drinking. Well, I offer this picture to try and change your mind. I will also take a moment to remind you of 'the rules' and one of the rules is "Garnish Matters." Limes, Kiwi, Bananna, Hibiscus, and the weird looking space creature is a Gloriosa Lilly. 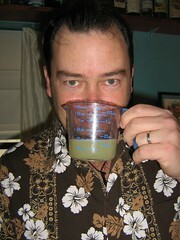 In the drink is some Pineapple Mint. And, here is the FOM Flag in full display at the Bahia Cabana for the 2007 Hukilau. As soon as we hit the party I saw an American Flag hanging from the walk-over and then I spied a little bit of string hanging next to it. Well, you can see the end result. I will have more to show and report on Hukilau later. In the meantime, click the photo and see what I have hiding in Flickr.